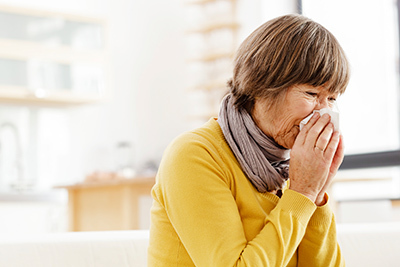 Elderly Pneumonia FAQ: Learn the Signs and Risks for Wellington Seniors | BrightStar Care " "
If you help care for your aging Wellington senior parent, then you’ve probably heard the importance of taking preventative measures against pneumonia. That’s because seniors are much more prone to catching the illness. In fact, according to a 2009 study, the annual incidence of pneumonia among adults over 65 is four times that of younger populations. Read our FAQs to learn why and get tips to identify pneumonia symptoms and ensure a speedy recovery for your parent. Older Wellington senior adults with dementia may not communicate that they’re not feeling well, thus allowing an infection to go unnoticed and worsen. Wellington Seniors are more likely to have other conditions, such as heart disease or COPD, that when combined with pneumonia can create dangerous complications and even death. Even a mild case of pneumonia can further weaken a senior’s already weak immune system, which can turn an underlying condition, such as heart disease, into a life-threatening malady. However, as noted above, symptoms may go unnoticed in a Wellington senior who might experience these conditions on a normal, healthy day. "The symptoms and signs are sometimes not as specific,” says Dr. Joseph Mylotte, a professor of medicine at the School of Medicine and Biomedical Sciences at the University of Buffalo, (via A Place for Mom). “They may be more sleepy and lethargic, or lose their appetites, or they may suffer from dizziness and fall." BrightStar Home Care of Fl - Wellington proudly provides support for the elderly and children, including 24 hour skilled nursing and support in senior independent and assisted living communities. Additionally we provide Medical Staffing and In-Home Physical Therapy for pediatric, adult and geriatric patients, Companion and Personal Care for Elders with Alzheimer’s or Dementia. We also provide Home Child Care, Sitter and Nanny services for Children and Support for New Mothers. We Support Veterans and Accept most Long Term Care Insurance benefits, provide Hospice care, Live-in care, CNA, Caregiver, RN, LVN, RN Supervision, Compassionate Care, and Compatibility Guarantees. Other services include safe discharge and transportation from the hospital or rehab facility, Post Op care both short and long term, Pre Operation and preparation help and assistance, and client monitoring for out of town family members. Proudly serving Atlantis, Greenacres, Hypoluxo, Lake Worth, Singer Island, Lantana, Manalapan, Palm Beach, Riviera Beach, Royal Palm Beach, Wellington, and West Palm Beach in Fl.